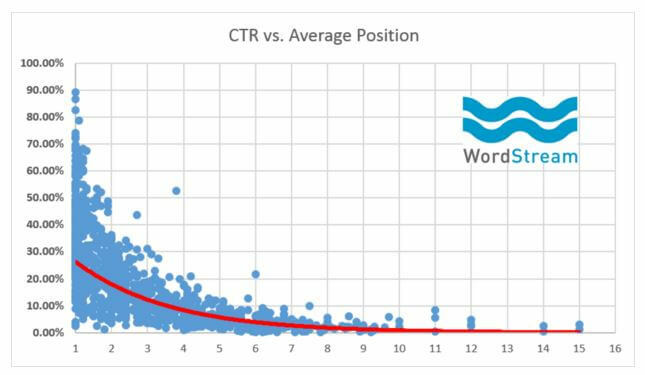 Optimizing for a higher click-through rate (CTR) allows users to attract more clicks to their website as well as conversions. In regards to organic searches, many people don’t even think about optimizing for CTR. In fact, Google only gives users a sampling of 1,000 queries in the Search Analytics section of the Search Console. In Analytics, it’s easy to view the number of impressions and clicks for your top 1,000 pages, but there is limited query data. One way to improve your CTR is to download all of your query data from the Search Console. The next step is to graph CTR vs. Average Position for queries you rank for organically. Above: The red line indicates your average click-through rate. Now you’ll want to focus on those with the highest conversions. If you’re more concerned with engagement, then you can filter by metric. When you improve the CTR of this page, more people will engage with your content. You can also collect data by setting up a Google AdWords account and creating an ad pointing to the page you’re reoptimizing. Use 10 different headlines to see which one has the highest CTR. When writing and testing your headlines, it’s crucial that each headline is completely unique.